Complex turning and processing requires a machine that can take the heat. 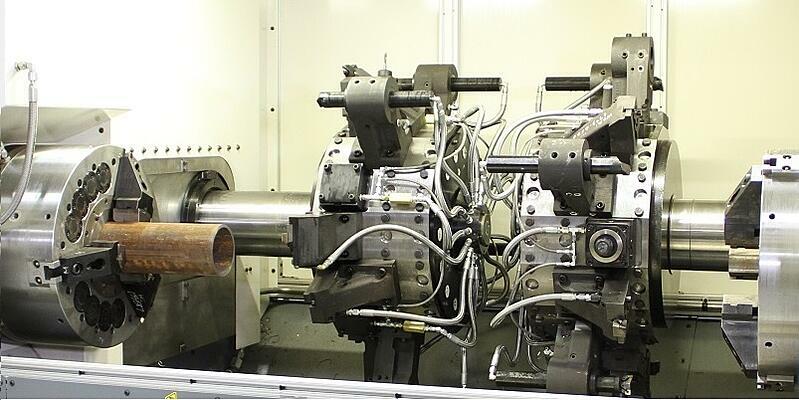 The Bardons & Oliver 4-axis sub-spindle lathes are engineered for flexibility and durability. Our heavy-duty column-style 4-axis sub-spindle design includes the ability to process complex bar and tube components with no diameter, weight or length limitations. The flexible 12- and 15-station turret and tooling systems are made for taking heavy cuts while holding precision tolerances. Standard collet chuck sizes for these machines range from 3" to 6.5". When combined Bardons & Oliver’s automatic bar feed and Bardons & Oliver’s finished part unloader, the sub-spindle system can produce finished parts from full-length raw material in one fully automatic operation, including parts with complex machining on both ends. Finished part lengths can range from 6" to 30 feet long. Bardons & Oliver has more than a century of machine tool expertise. Our employee-owners find custom engineered solutions to the most complex Machine Tool and Contract Machining challenges.